The Federal Government, on Tuesday, alleged that the proscribed Indegeniuos People of Biafra, IPOB, were behind recent cache of arms that were intercepted in Lagos by the Nigeria Customs Service, NSC. 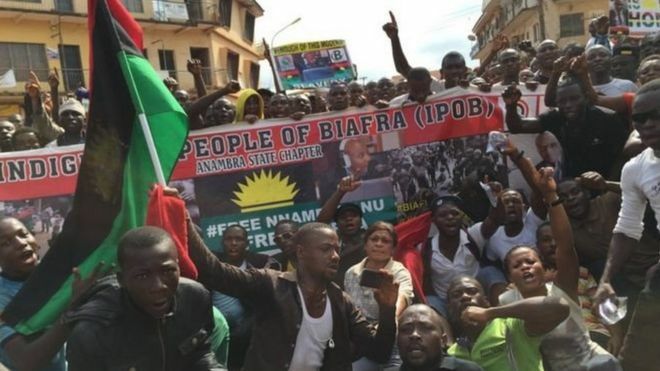 IPOB cartoon FG, while justfying its decision to apply for the IPOB to be outlawed, told the Federal High Court in Abuja that its investigations revealed that members of the group imported arms, comprising of pump action rifles, from Turkey. The Solicitor General of the Federation, Mr. Dayo Akpata who represented FG, urged the Acting Chief Judge of the high court, Justice Abdu Kafarati, to dismiss the motion IPOB filed to quash the proscription order. It will be recalled that Custom operatives had between January and September this year, intercepted about four containers laden with arms. 1,100 pieces of pump action rifles that were recovered at the Tin Can port, Apapa, Lagos, on September 19, brought the total of such arms that were seized since January this year, to 2, 671. Meantime, in a 23-paged counter-affidavit it filed in opposition to IPOB’s motion dated September 21, FG, told the court that the secessionist group “have been associated with violent activities”. It said: “Furthermore, the leader of the Respondent/Applicant, one Nnamdi Kanu has been openly advocating for armed struggle via his speeches, calling Nigeria a zoo, threatening that Nigeria will burn if he is arrested, etc. The intent of the Respondent/Applicant from the onset is to cause confusion and plunge the country into crisis. “That a Turkish citizen, Abdulkadir Erkahraman, visited Nnamdi Kanu the leader of the Respondent/Applicant in Isiama Afara, Umuahia, Abia State sometimes in July 2017, and has been canvassing support for the secessionist agenda of the Respondent/Applicant. He also admonished ‘Biafrans to rise up and fight a good fight for freedom’.